Home » Health » Oral Healthcare » Kid's Oral Care » Pediatric Sedation Dentistry – Is It Safe for Your Kid? Most of the times, children are anxious and fearful for undergoing dental procedures. In such cases, to perform the extensive dental procedures with ease, sedation dentistry is the best solution. As a parent, it is so obvious for you to be concerned about the safety of the process for your kid. But, the good thing is that the sedation dentistry is safe for the kid if performed by an experienced dentist under the medical supervision. Child on the dental chair is the most challenging patient to handle. They are often uncooperative due to anxiety, previous bad experience, fear of dental operatory, fear of the white coat, etc. Such kids cannot sit in the dental chair for the longest time and are difficult to manage without sedation. In this scenario, the dental sedation act as the safest solution to make your child sit calm and relax in the dental chair. Now, your kid can undergo a painless dental treatment without the memory of the procedure. Let’s us know in detail about the pediatric sedation dentistry and its safety aspects. Safety of the kid is the utmost important thing during child sedation. Parents and dentist, both play an equally important role in the success of the procedure. The dentist will decide the type and the level of sedation for your kid, based on the need and procedure to be performed under sedation. The amount of sedation is the prior thing to be taken care of beforehand. Because if the sedation level increases, it may arise breathing difficulty in a child. However, it is not the life threating situation and can manage with medical supervision. But, it is always better to go for planned sedation and experienced dentist for your child’s safety, than landing in complications. Parents play a significant role before the sedation of their kid. As a parent, you need to understand the procedure thoroughly and should prepare yourself first. In this way, you can make your kid aware of things involved and can prepare him or her as well for the procedure. Child deal with the process smoothly if they are explained the complete procedure by their parent. So, do your best and answer every question that your child will have. When you bring your child to clinic keep them calm by encouraging words. Follow the below guideline before administrating the sedation to the child. Before the procedure, the dentist goes through the complete review of the medical history and perform a thorough examination of the child. A dentist must check for enlarged tonsils or any other abnormalities which may block the child’s airway. Your dentist will ask the questions about past, and current health status of the child, medication history of the child, allergic reactions noticed in the child, etc. Parents should promptly answer all the questions in details. There are rules for eating and drinking that need to be followed hours before sedation. The contents of the stomach may react with the sedatives and often vomited during sedation. Hence, make sure your child listen to the food or drink restrictions given by the dentist. Sedation must be administered by experienced dentist only, under the medical and dental supervision. All the emergency medical operatory and assisting staff should be prepared before starting the procedure. A dentist should make a careful evaluation to see if the kid is a good candidate for sedation. You should dress your kid in loose and comfortable clothes. So that, the dentist can easily monitor the health of your kid. During the sedation, a child’s safety is a priority. While the child is under sedation, the dentist monitors their blood pressure, blood oxygen level, heart rate, and temperature. Kids always look for their parents when they are anxious. So, be with your child, hold his or her hand, caress their hair, use encouraging words, bring their favorite toy or sing a song for them until your kid feel drowsy. Once the child is sleepy, you can leave the operator’s area and let the dentist perform the procedure. Once the sedation starts to draw its effect, the child often reacts in different ways. They may cry, be fussy or confused. You should be present before your kid comes up from the effect of sedatives and help him or her to calm down. A child may experience dizziness, temporary loss of physical coordination, sleepiness, etc. for hours after sedation. Take your kid home for the rest and limit your kid’s activity for a day. Even after the sedation, a child needs to closely monitored for hours. And in case of any symptoms including vomiting, severe pain, bleeding or fever parents should contact the dentist immediately. The dentist selects the type of sedation to be used based on the type of procedure and the intensity of the child’s fear. Depending upon the intensity of the sedative, sedation categorized in the following categories. Mild sedation is the minimal and lightest sedation. A child is in a conscious state during mild sedation. In this type of sedation, the dentist often uses oral medication or nitrous oxide gas, i.e., laughing gas to reduce the anxiety of the child. Moderate sedation makes your child feel calm and relax during the procedure. The sedated child is in a conscious state and can respond to the questions as well. But, they do not have the memory of the procedure. In deep sedation, a patient will be asleep with some movements but will not be unconscious. A child can listen to you and respond to your questions. In general anesthesia, the kid lies in an unconscious state with no movement or vocalization. A child is unable to respond to external stimuli. General anesthesia is required if the child has to undergo a major surgical procedure and performed by the trained practitioner only. Sedation dentistry works best to deliver the painless treatment. Your dentist will make the right choice of sedation for your kid based on the medical history of the child and level of sedation required. Consider the sedation safe for your kid on the approval of your dentist. 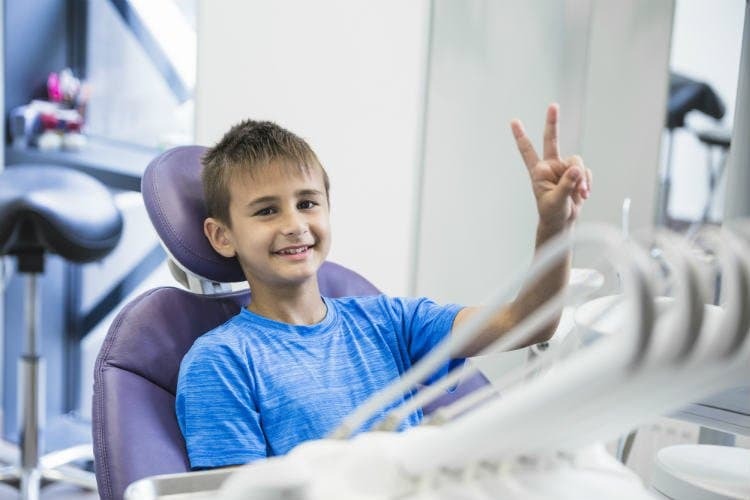 Now onwards, you need not to worry about the anxiety of your kid for dental treatment and can get the procedure done with the help of sedation dentistry.